We were out in a chicken restaurant last weekend, and we usually love our fried chicken with ketchup. For me, it's sweet banana ketchup; I've never been fond of tomato ketchup, although I will take that when there are no options. Well, here's a nice way to spice-up your ketchup dip as provided by friend Janice. Add a small amount of worcesterchire sauce. Add a few drops of hot sauce, depending on your preference. And you get a spicy, tangy, delicious dip for your crispy fried chicken! I love mixing banana catsup with worcestershire sauce especially when I'm at Max's! Di ko pa yan natatry, masubok nga minsan. 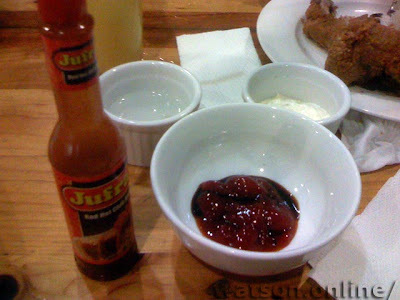 Ann: Masarap sya... may variety from the plain ketchup. Toni's right, That's also my favorite dip recipe at Max's. As for the banana catsup, I like it with McDo's chicken. Too bad, they dont serve banana catsup anymore. What's in Manila: thanks for dropping by my blog! I thought McDo will give you banana ketchup in sachet if you ask for it... wala na rin?